The Rhinoceros Hornbill has a prominent golden-yellow horn, called a casque, on the top of its beak. The casque is a hollow structure made up of keratin (the same material as human fingernails) and acts as a resonating chamber, amplifying the bird’s calls. They have black feathers on their wings and body and their tail feathers are white. Both male and female Rhinoceros Hornbills are similar in appearance, but the male birds have an orange or red ring around their eyes, while females have a white ring. For some of the native Dayak groups of Borneo, the Rhinoceros Hornbill represents the chief of the birds and it is the state bird for the Malaysian state of Sarawak. Rhinoceros Hornbills feed mainly on fruits and insects, but may also prey on small reptiles, rodents and smaller birds. Like other hornbills, the adult Rhinoceros Hornbills form breeding pairs and have unusual nesting habits. The pair build a nest in a hollow tree and seal the opening with mud, faeces and food remains – with the female inside. Only a small hole is left, through which the male passes the female regurgitated food, while the female incubates the eggs. The Rhinoceros Hornbill occurs only in the forests of peninsular Malaysia and the islands of Sumatra, Java and Borneo. 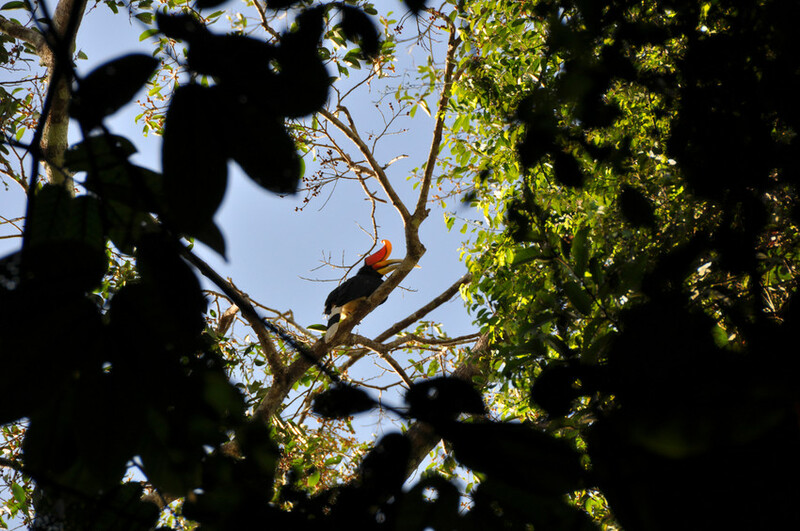 Both hunting and habitat loss threaten hornbills. Hunting is both for food and traditional medicines, while various parts of the bird, particularly the feathers, beak and casque, are used in costumes and rituals. 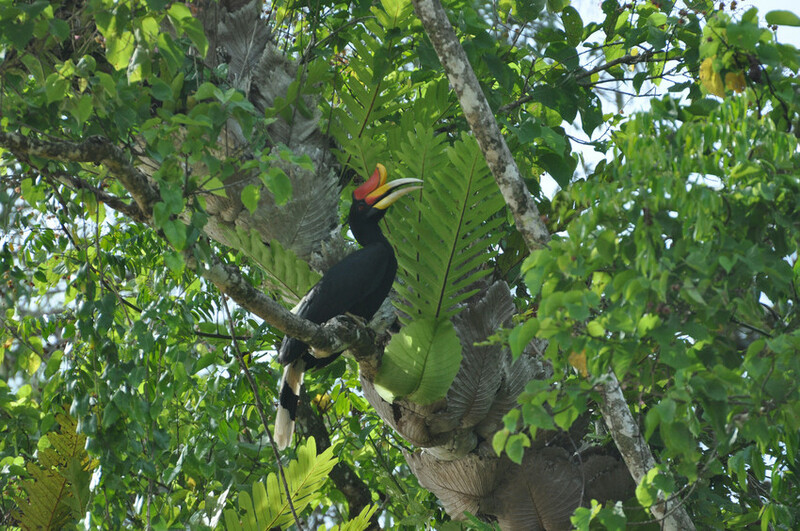 Rhinoceros Hornbills will not use secondary rainforest and this further restricts their distribution.